Logicalis is ready to explore with you how you can take advantage of IoT and Analytics driven solutions. Our consultative approach, delivered through workshops and assessments, will guide you to solutions that can have real business impact. Things – Identify how connected devices can play a role in your business and drive transformation. Services focus on generating data for real-time analysis and business intelligence, from sensors, medical devices, applications, mobile devices, machines, and robots, to name a few. Connectivity – We bring expertise necessary to connect devices and things to each other and to IoT platforms, data management platforms, visualization and analytics engines. Technologies like software defined networking (SDN), the intelligent edge, wireless networks, Bluetooth (BLE), and cellular provide the connectivity. Platforms – We will help you identify the right platform for your business and provide education on software platforms that are used to configure, manage, and capture data from devices and things. These platforms, delivered in public, private, and hybrid cloud models, provide businesses with valuable insights into the data collected from devices and things. Data Management – End-to-end lifecycle management, including data governance, control, better data quality, and the ability to present data to analytics platforms. Visualization – Presentation of real-time or historical data from structured, unstructured, or semi-structured data sources. Logicalis’ extensive experience worldwide provides you with the ability to “see” your data and use that newly found insight to make intelligent business decisions. Artificial Intelligence – Cloud, hybrid, or on-premise platforms incorporating deep learning and machine learning to assist human beings with cognitive tasks. 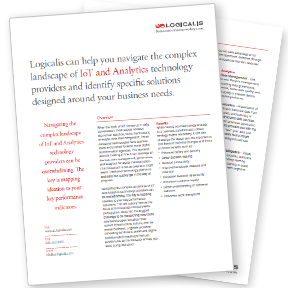 Logicalis can help you navigate the complex landscape of IoT and Analytics. Download this datasheet to learn more.